Our first three Denali expeditions were exposed to some of the worst weather that Denali has to offer. The fact that two out of these three teams were able to reach the summit in very small windows of barely acceptable climbing conditions is a huge testament to the abilities of the climbers and the skillful decision-making and leadership of the guides. 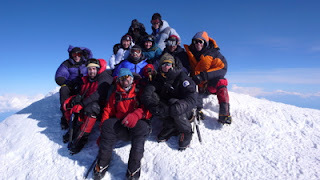 Very few teams were able to successfully reach the summit in May, safely and without injury. In fact, by the time our fifth expedition headed onto the glacier on June 3rd, the overall success rate was a dismal 37%. Weather and conditions on the mountain improved considerably during the beginning of June, and all of our teams in June reached the summit, two in record time (16 days round trip). In all it was an exciting season in Alaska with many significant climbs being done on and around Denali. Seattle based climbers and friends of AAI made ascents of the Denali Diamond and the Cassin Ridge in June, both great accomplishments. -Five out of six AAI teams (83%) found success on Denali's summit this year. The team that did not summit experienced very poor and sustained weather conditions. -Individually, 48 out of 64 AAI climbers reached the summit (75%). -The Institute's success rate for individuals for the last nine years is 76% and for expeditions it is a very steady 83%. The average individual success rate for all climbers on Denali is 54% overall and 59% in guided groups other than AAI. As our summary of this season again demonstrates, the American Alpine Institute's Denali expeditions are the safest and most successful expeditions on the mountain. We achieved this through a number of carefully created and continually analyzed processes developed over our near 30-year history of guiding on Denali. To find out how we accomplish these things and more, please visit the Denali page on our web site (link) or speak with our expedition coordinator whose contact information is listed below. AAI's commitment to building strong teams capable of achieving their climbing goals while maintaining the highest level of safety continues to be unmatched in the industry. Read the season's dispatches. Read the day-by-day satellite phone reports from our Denali guides. Take the virtual tour. Check out pictures and video from the West Buttress route. Recently updated with photos and video from the 2007 season. Interested in Denali 2008 or Denali training? Get in touch with Coley Gentzel, AAI Alaska Programs Coordinator and Denali guide at cgentzel@aai.cc or by calling 800-424-2249 or 360-671-1505. We are pleased to announce that American Alpine Institute has started a blog! Here you can find random updates, bits of news, route updates, formal news releases, plenty of photos, and much more. For now, we will be continuing our trip and expedition dispatches on the Dispatches page of our website (www.aai.cc/currentnews.asp), but if you think that the dispatches would be better off here in our blog, let us know via the comments feature! We plan to gradually transition to using our blog more and more. If you have thoughts or ideas on how this could be a resource for you, let us know! We hope you're having a great summer, and hope to see you in the mountains soon!